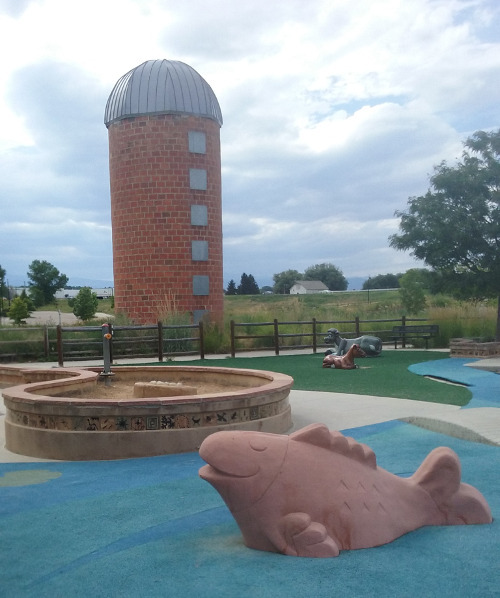 Sandstone Ranch was my favorite park when we lived in Longmont. It has a bit of everything: playground for toddlers, playground for bigger kids, tire swing, and, most importantly in summer, a splash pad! When Calvin was young I adored splash pads because he could get wet without me having to be within arms reach of him the entire time. Today I had to run to Lowes in Longmont so we took a detour to visit the park. Unfortunately, I didn’t get particularly good pictures this time as Julian was fussy. However, hopefully you can get the idea. It’s a bit tricky finding the playground for the first time. Drive east on 119 past the Walmart and turn right onto Sands One Dr. Take the first right into the parking lot. Turn right again and follow the road as it meanders west until you end up in a parking lot with the skate park, adventure park, and restrooms. From the parking lot, the first section is the toddler playground. It has a small teepee, cabin, spinner, spring riders, and musical panel. 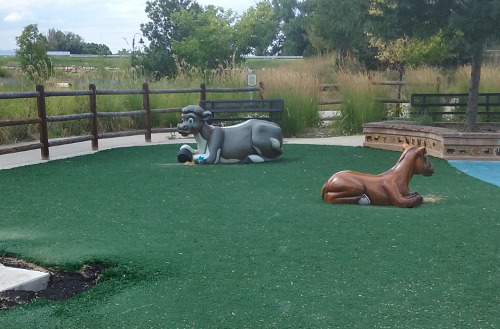 Behind the first section are farm animal statues for the kids to climb on. There use to be a tractor and a log that the kids could climb through but those must have been damaged beyond repair at some point. This section also contains a raised sandbox area. It use to have water hooked up which was fantastic. I’m not sure why but the water aspect hasn’t worked for years (possibly sanitary issues?). There’s also a sand area that is level with the ground. There’s a statue of a fish, a frog, and a turtle for kids to crawl on. The one big downside to this park is it is impossible to watch kids in both the toddler and the older kid section at the same time. There’s wonderful landscaping around the play areas but they obscure the sight lines. By the toddler section are bathrooms (open in summer), drinking fountain, and a fairly large covered shelter. There’s another shelter close to the splash pad. However, it looks like the other benches will often be in direct sunlight. 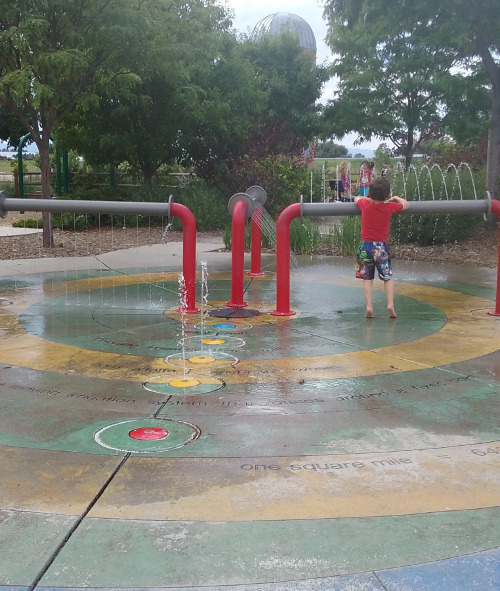 The splash pad is one of the best parts of the park. There’s a button to turn the water on. It turns on for several minutes and then there’s an enforced delay of several minutes where the water will not turn back on no matter how many times a child slams the button. Behind the splash pad is the “tree house” play area. Calvin would play on this area, with close supervision, by the time he was two years old and it absolutely terrified me. The New York Times had recently published an article about the dangers of safe playgrounds which I theoretically believed but is much harder to put into practice. Parts of the structure are high enough I have trouble touching them with my hands over my head. Now Calvin is old enough to play in the tree house area without too much supervision and Julian isn’t mobile yet so our visit today was much more relaxing than prior visits have been. The climbing options on the opposite side from the caterpillar slide always made me particularly nervous. Naturally, Calvin loved crawling up them. It’s hard to tell from the pictures that I have but the tree house structure is connected to a small hill with a bridge. There’s a covered slide protruding from the hill. There is also a tire swing and a rope climbing structure for older kids to enjoy. 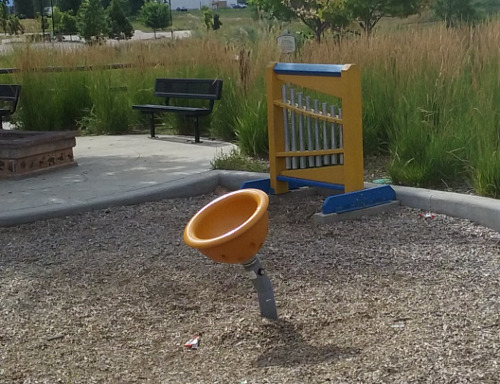 There are no traditional swings at this playground. 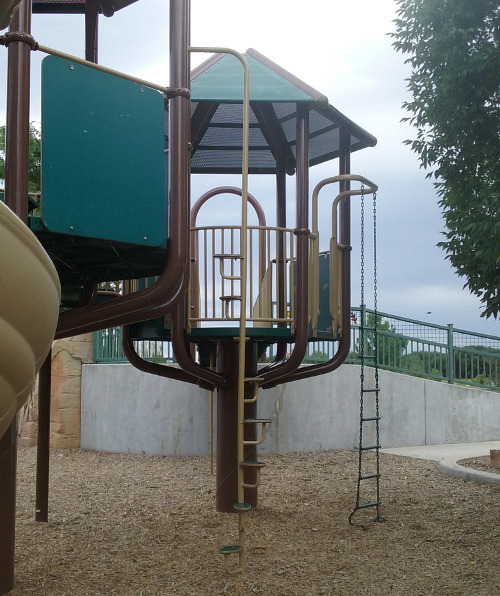 Sandstone Ranch is an entire complex that includes a skate park (close to the toddler play area but mostly hidden from view due to elevation) and sports field. 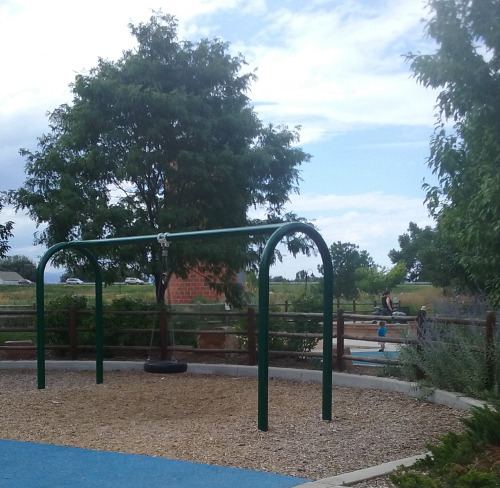 On the east side of the park is a smaller playground area. It has a more traditional-style equipment and I think it has regular swings (though I can’t remember for sure). 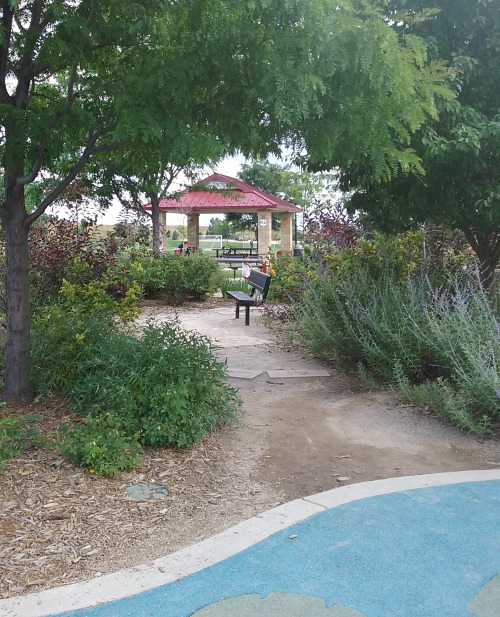 There are a lot of walking paths that connect various parts of the park and also connect to the St. Vrain Greenway trail. We don’t visit this park much anymore due to all the great parks in Boulder. However, it’s still worth the occasional visit when the weather is hot. 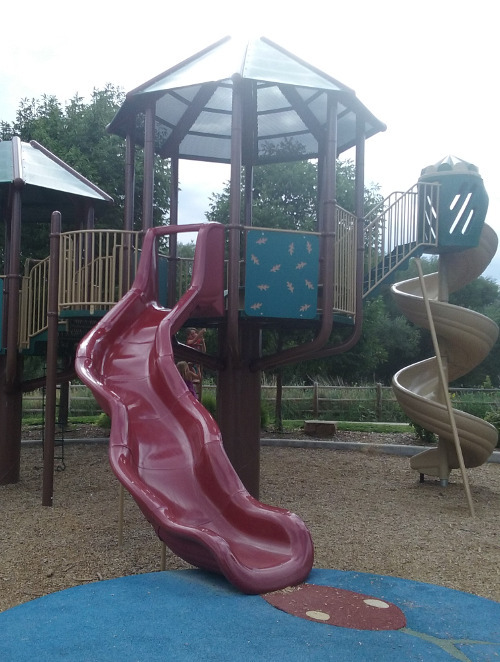 Features 2-5 playground equipment, 5-12 playground equipment, spinner, caterpillar slide, corkscrew slide, covered slide, trapeze steps, leaf steps, small hill, tire swing, water/splash area, sand, spring riders, teepee, statues to climb on, play house, musical panel, rope climbing structure. Shade There’s several shelters by the park which are available as long as no one has rented them. There’s also trees and other landscaping that provides varying levels of shade. The toddler play area doesn’t have a lot of shade. The older kids’ play area has a bit more due to the height of the structure itself. Picnic area Yes, two covered shelters with multiple picnic tables. Hard to see older kids and toddlers at the same time. 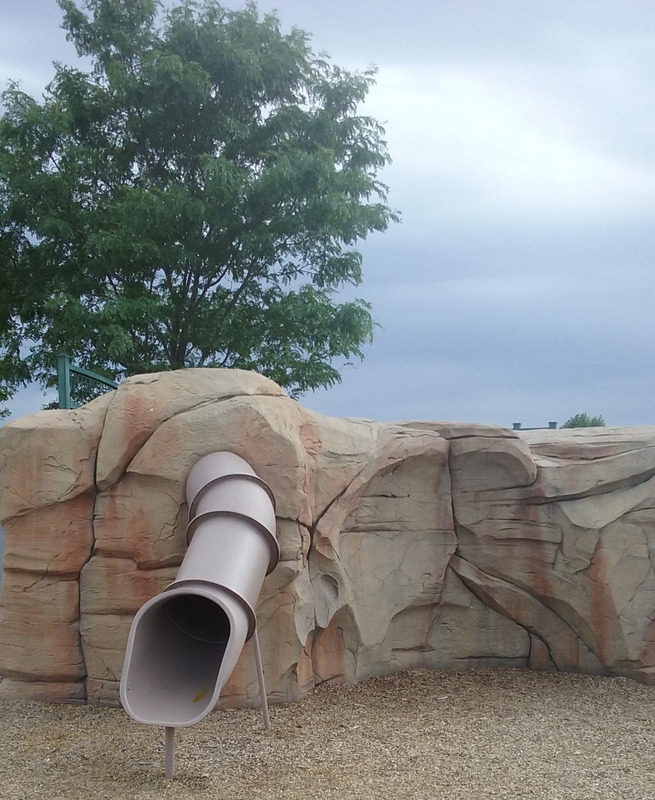 This entry was posted in Parks and Playgrounds on July 20, 2015 by kiesa.